Are you fond of buying jewelry? If yes, then you would agree that storing jewelry safely is extremely important. It not only prolongs the life of an ornament, but also avoids contamination and tarnishing. Proper storage also ensures that the brightness and sparkle of the jewel will remain for a long time. An important aspect of storing jewelry is that each of type of jewelry demands a different setup. Believe it or not, inappropriate storage of jewels and precious stones can make the ornaments worth much less than their original value. So, if you want to know how to store jewelry in the right way, check out the tips given below. Sturdy cases with soft, lined interiors serve as the best bet for storing your precious jewelry safely. While the tough exteriors would defend it from any external pressures, the soft interiors of the case would not cause unnecessary scratching or rubbing of the jewelry. In case you do not have a jewelry case, placing the jewelry in soft fabric pouches would be an ideal option to explore. These pouches make a good choice in space restricted areas as well as while traveling. Nowadays, multi-storage pouches are also available, which have defined spaces for keeping different types of jewelry. While there is a horizontal space for keeping all the chains and necklace, rings and ear tings can be stored on padded cushions available in the pouch. A three drawer organizer is also available to store different jewelry. While one drawer can be used for storing necklaces, there is another one for bracelets and a third for keeping charms and rings. Another efficient jewelry storage option is a small plastic zip-lock bag, with an anti-tarnish strip. The bag not only protects the jewelry, keeping it safe, but also serves as a good option for delaying tarnishing in jewelry. If you are crazy about necklaces and have umpteen collections of them, the best would be to get a necklace holder. 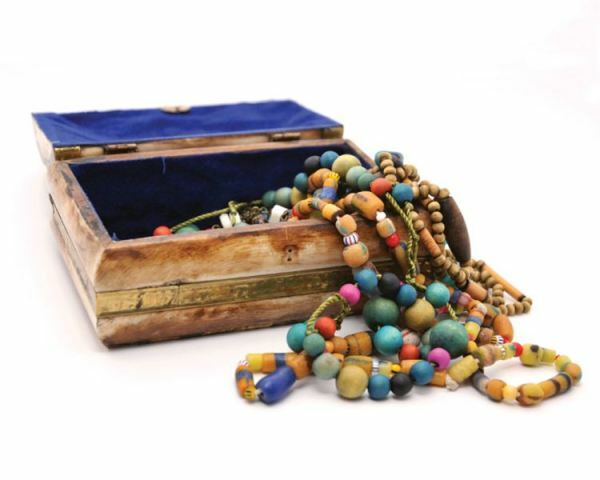 It would keep all the necklaces safe and also prevent them from entangling. Silver jewelry is best stored in a tarnish-resistant cloth and case. They help retain the original shine of the ornament and also protect it from any mishap. Pearls are extremely soft and supple and need to be stored safely. A soft dust free bag would be the ideal option in this case. Gemstones are susceptible to cracking and scratching. So, a good way to store gemstones would be to keep them in a separate pouch, in a place that has stable temperature. Jewelry should always be stored in a dry location, with low humidity. At the time of choosing, consider the security and accessibility of the location as well. Make sure you store each of the jewels individually. Else, chances are that the ornaments would get entangled and scratch each other. Store gold, silver and pearl jewelry separately; to lessen the chances of their getting contaminated, tarnished, or dull. In case the box or the pouch you chose is not an anti-tarnish one, make sure you put in moisture-absorbing products, such as white chalk, charcoal or silica gel, inside your jewelry box. These will absorb the moisture which can, otherwise, cause tarnish. Keep your jewelry box in a safe place. The place should be away from high heat and excessive moisture, as they might cause damage to the stones.